Happy July dear readers! Beginning with this post we embark on the next half of the year and the next half of our mindfulness practices. Woo-hoo! 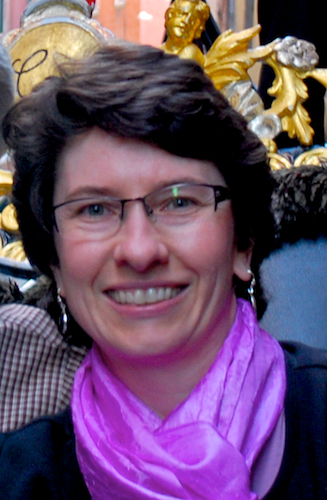 How did you do with last week’s practice to study suffering? I admit that it is one of the more curious practices. 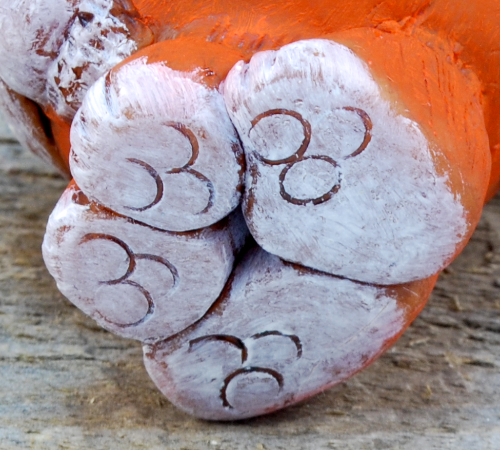 Not only does it bring more awareness to our own thoughts and suffering but also the suffering of others in subtle ways. I’m still wrapping my head around it at this point. Alright, what a way to follow last week’s practice. Are you familiar with silly walking? Now that you’re smiling if not laughing, can you see the point of a mindfulness practice using silly walks? 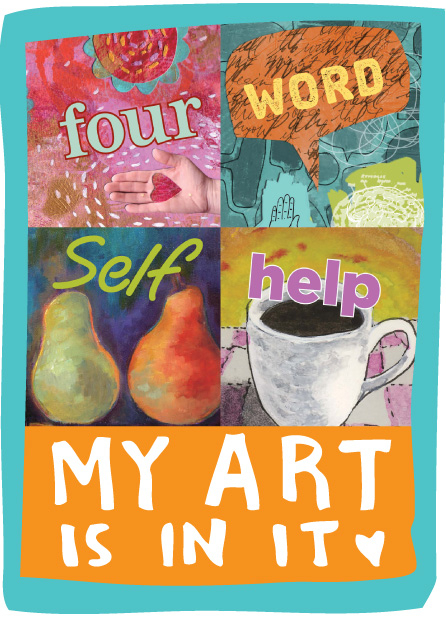 Last week we studied suffering which really starts with oneself and becoming aware of negative thought patterns. Now consider what would happen when the negative voice is ready to rage in your head and instead of going down that path you did a silly walk instead? What happens to your state of mind or mood? The objective behind this mindfulness practice is two-fold: to become aware of our negative thoughts and to become aware that only we can change our mood. We cannot depend on people or things outside of us to change our difficult emotions. Doing this task reminds us to take ourselves lightly. Categories: Humor, Monty Python | Tags: change, change your mood, Humor, ministry of silly walks, Monty Python, silly walking | Permalink. 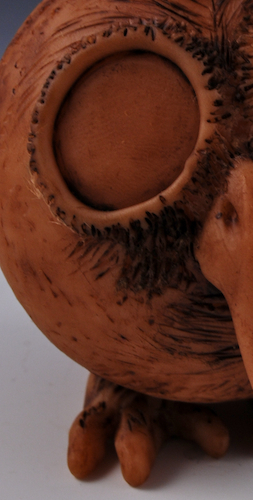 A few weeks ago, I introduced you to one of my new Ornimals, the Graduate Owl Ornimal. This piece received good feedback so I decided to make more for the upcoming Graduation season. And then I hit a wee little snag. I couldn’t find any 2″ glass bases in order to make more Graduate Owl Ornimals. I only had two left in my studio and one of those bases was supporting my prototype. Geez, I really hate it when a good idea comes along and then you can’t find the necessary materials to make more. I hunted around online, talked to some friends, and finally found a source. Thrilled with finding an online supplier who had the bases in stock, I placed my order. A few days later a box arrived. I anxiously carried it to my studio, opened it up, pulled out one container and said “Oh crap, they’re the wrong size!” And I mean they really were the wrong size by a whole 1/2 an inch. The thought of returning the bases didn’t cross my mind. I was sure I’d find a way to use these small glass bases. I accepted this as a challenge. 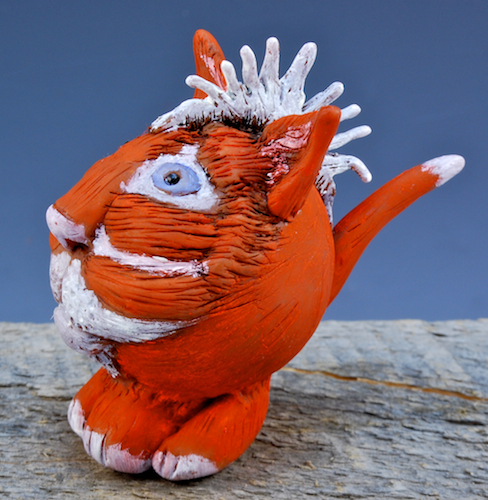 Thankfully the creative muse was on my side and within a few days this new little guy was sitting on my worktable. Somewhere a proud Tiger Striped mom cat shakes her head and smiles. And I won’t lay blame for this little guy on Robert Palmer, who happened to be singing away in iTunes while I worked. As always, thanks for your continued support on this journey. And thanks for stopping by…. 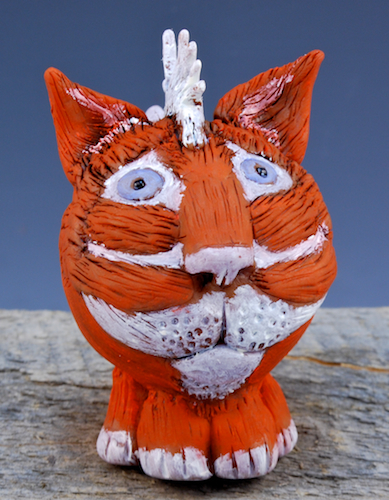 Categories: Amy's Art, Humor, Polymer Clay, Sculpture | Tags: Cats, Humor, Polymer clay, punk and mohawks, Robert Palmer, Sculpture | Permalink. Over the last couple of days, I shared with you two pictures of a new Ornimal that I created this week. I asked you to guess what you thought the critter would become. 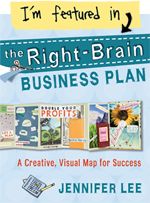 You were on the right track when you guessed something in the bird family: a chicken, a duck, a goose, or an ostrich. Today, I reveal the finished piece. I had fun creating this new Ornimal, especially adding his graduation cap and feet. The addition of the feet make him mult-functional; you can display him on a shelf or table or you can hang him from a hook. I’m contemplating the addition of a small tassel, perhaps making them individual to the graduate’s school colors. The Graduate Owl Ornimal is available for purchase for $28.00. Orders happily accepted for delivery in time for May or June graduations. 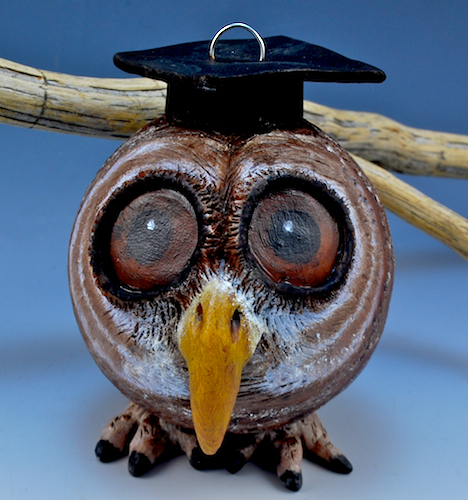 The Graduate Owl Ornimal is approximately 3″ tall. Thanks to everyone who sent in their guesses and congratulations to Jean W who correctly guessed that this was an owl based on the part 2 image post. Categories: Amy's Art, Ornaments, Polymer Clay, Sculpture | Tags: bird family, Graduation gifts, Humor, owl ornaments, owls, Polymer clay, Sculpture | Permalink. 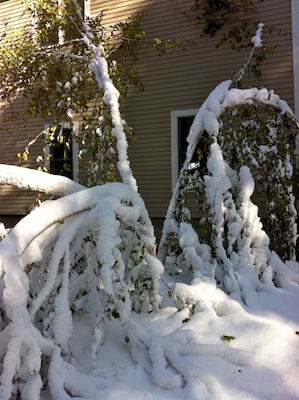 Though the weather people weren’t quite calling it the “perfect storm,” the October 2011 snowstorm seemed to form on perfect though perhaps freaky conditions: a cold front moving down from Canada colliding with moisture moving up the east coast. A few degrees warmer and it probably would’ve been just another wet weekend. Instead we got Snowtober. 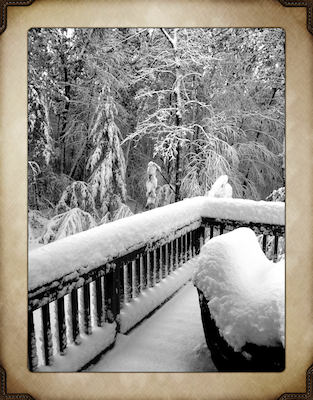 12″ of wet snow in central MA and over 2 feet of snow in other areas. We’re used to snow here, though getting walloped in October is not a welcome sight. 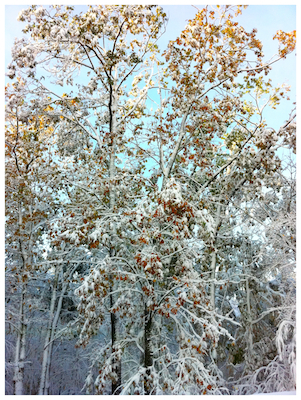 What made this worse than the ice storm of 2008, however, was the trees still holding onto their leaves. 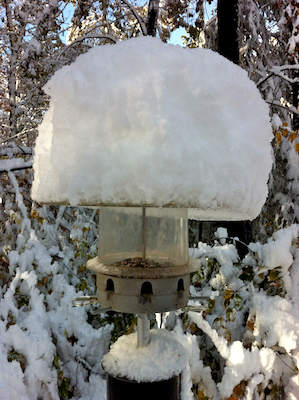 Heavy wet snow on top of trees that haven’t lost their leaves can only result in one thing. 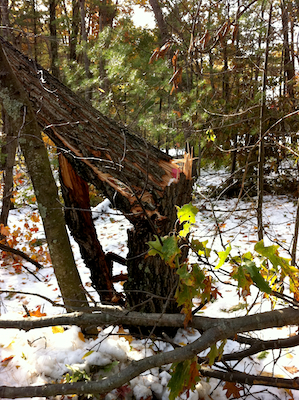 Cracked, snapped, and sheared off tree limbs crashing on power lines and phone wires. And if that didn’t take out the power, the snapping of the poles themselves was the final insult. As one town worker told us, some areas looked like war zones. Our whole town lost power. Power was returned to the town in chunks. Some parts of town got their power back after four days. Some not till day seven. Our power came back on after 6 days. 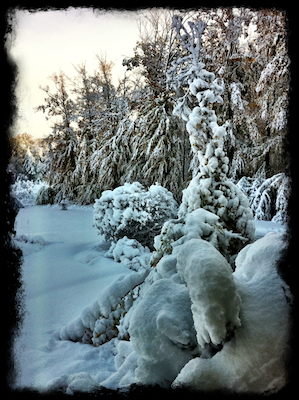 Below are some pictures that I took in the days following the storm. All the pictures were taken with my iPhone. Several were edited using the Camera+ app. 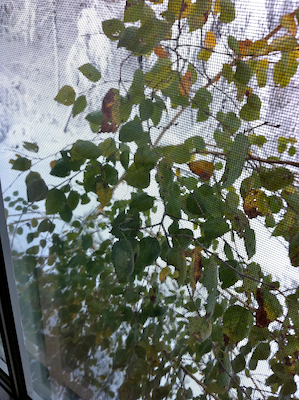 The next three pictures show the birch tree in our backyard. 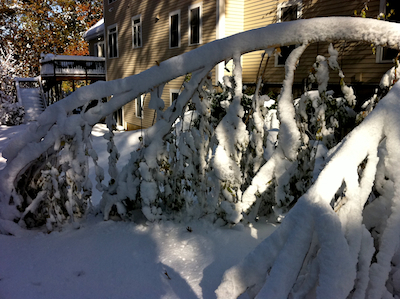 The weight of the snow on its branches caused one stem to crush against our bedroom window. Same tree split apart by the weight of the snow. Thankfully the birch has almost fully recovered in the past two weeks and is standing nearly as tall as it was pre-storm. 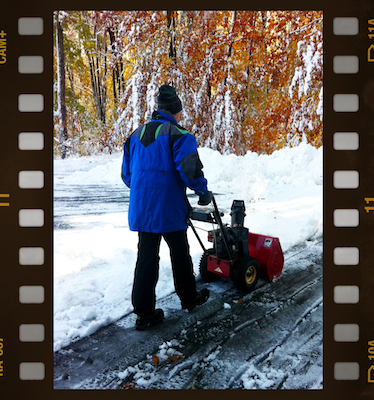 Snowblowing in October just isn’t right…. 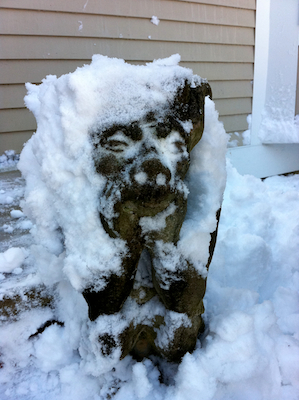 Sir Bruce, our gargoyle, wasn’t very happy with all the snow either. 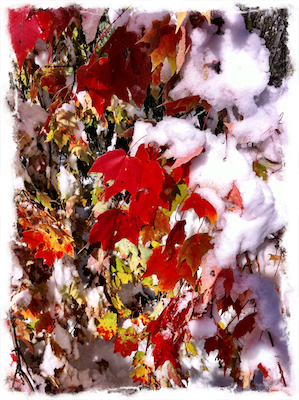 Yet the contrast of the red sugar maple leaves against the white snow was quite stunning. 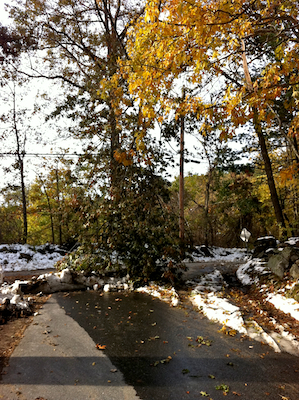 Trees that snapped and blocked the road. At least the kids in the neighborhood had the right idea. 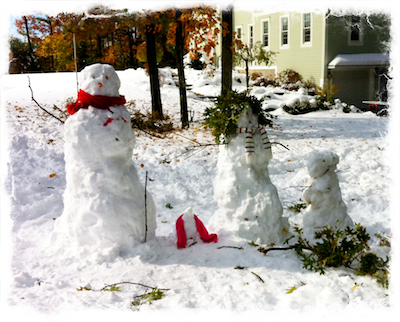 Loved their snowperson family. 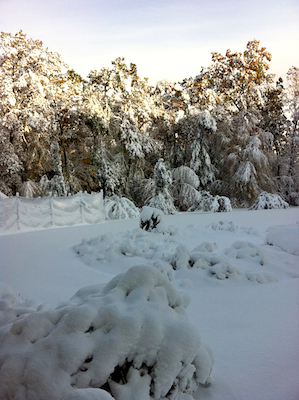 Categories: Environment, Nature | Tags: chainsaws, fear, generators, gratitude, Humor, Nature, October 2011 snowstorm, power outage | Permalink. Someday his Princess will come…. 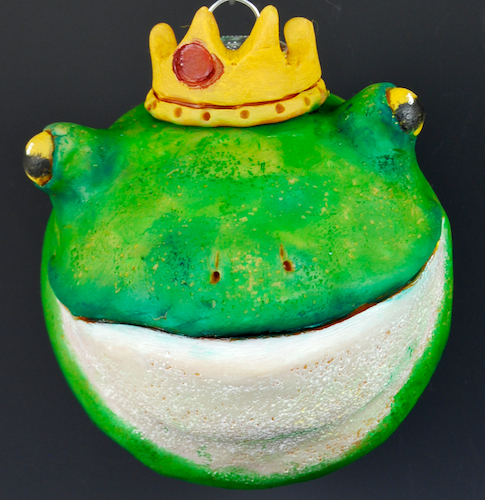 Categories: Amy's Art, Ornaments, Sculpture | Tags: Creativity, frogs, holiday ornaments, Humor, Peter Gabriel, Polymer clay, Sculpture | Permalink. When LOST ended, I realized there would be very little on TV that interested me. In fact, as this new fall season was approaching, I commented to my hubby that I was pretty unfamiliar with any of the new shows. Then I saw a listing of new shows in the NY Times. And I watched a few preview clips on YouTube. As of now, I still don’t think I’m missing much. It started with The X-Factor. Perhaps you couldn’t miss knowing about this show between the online ads and media chatter. I watched/listened to an hour of the premiere while working on my new series of artwork. 60 minutes of it was all I could tolerate. I really don’t like watching the auditions. Some of it can be very painful to watch and hear. This year was the first time I’ve ever watched American Idol. I was more curious about Steven Tyler and how he’d act on the show. Here, too, the auditions were tedious and the commercials annoying. Cut to the chase please. After while, the show began to wear on me. The judges were almost too nice. I mean, when I can hear a contestant singing off key and no judge comments on it, something isn’t right. Anyways, singing and dance talent shows just don’t do it for me. Person of Interest: Did you see this show? It caught my eye because Michael Emerson is in it. You’ll remember him as Ben Linus from LOST. The show is also a Bad Robot (J.J Abrams) production. Same folks who brought us LOST. So I thought it would be worth checking out. Impression: Eh. The premise behind the show, the government tracking its citizens post 9/11, storing data, recording your every move, and using this information to stop a situation before it happens sounded intriguing. But I’m not so sure the characters are interesting enough to keep me interested. Michael Emerson was okay. James Caviezel was a little flat. I give it a B-. Terra Nova: Another show I saw previews of over the summer. It looked like LOST meets Jurassic Park in the previews. The two-hour premiere confirmed that, right down to the tall gates built to keep the dinos out and the people in. Steven Spielberg is behind this mega budget show with the CGI dinosaurs. I like Jason O’Mara, who plays the father in this series and who I last saw in “Life on Mars” (US version.) And some of the action sequences were entertaining. But overall, just like Person of Interest, the characters aren’t terribly intriguing. In some ways the show feels a bit like “Land of the Lost.” I give it a C.
Project Runway: Okay, this show started back in August and I’d already missed two episodes before I knew it was back on the schedule. I’m a late-comer to Project Runway. I started watching a few seasons back, when they did their last show in CA before moving back to NY. This show has become my secret obsession. However I’m not feeling very attached to any of the designers this season. No one has been a real standout. But I still watch. I like Tim Gunn. I do wish Michael Kors would wear something other than that same black outfit. I was thrilled to see an ad for the upcoming Project Runway All-Stars series featuring Mondo from last season. He should’ve won Season 8. I think its great he’ll get another chance. Once Upon a Time: This show doesn’t start until October 23 on ABC. It appears to be this odd mingling of children’s fairy tales and real life where the “real life” characters are the actual characters living in the fairy tales. Huh? It comes from two producers from LOST. Check out the trailers here. This one could be very interesting. Alcatraz: Another J.J. Abrams show featuring another LOST alum, Jorge Garcia (remember him as Hurley?). Due to debut in 2012. Lots of chatter about this show but I don’t quite get the premise. A bunch of inmates disappear from Alcatraz 50 years ago and reappear in modern day CA. And they haven’t aged since they disappeared. Do they seek revenge? Do they go on a crime spree? Do I care? So these are just a few of the new shows I’ve watched or put on my calendar. I haven’t bothered with any of the comedies or dramedies or other reality TV shows. Nothing there seemed of interest to me. And really, some evenings I’d just rather be in the studio. What about you? Are you watching any of the new shows this season? How about the older shows, like House (now he’s in prison?) or Modern Family? Do you even watch TV on a telly or do you watch online? Categories: Creativity, Humor, Science | Tags: Alcatraz, Creativity, Humor, life, Project Runway, television, X-Factor | Permalink.